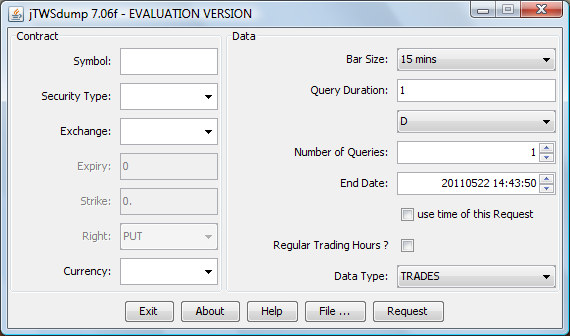 jTWSdump provides easy download (dump) of historical and intraday data with Interactive Brokers TWS. It generates formatted text files (Date/Time, Open, High, Low, Close, Volume) ready to be imported into any charting or analysis software. Data requests are performed through a graphical interface or through the command-line. Requests can be automated by providing an input file listing multiple contracts. jTWSdump works on Windows, Mac and GNU/Linux. NEW: support added for Futures Spreads and Stock/Stock Combos. Screenshot of the graphical interface in the Windows environment. Note the following limitations: a maximum of 5 years historical data is available and it is currently impossible to request tick data. You should also be aware of the limitations imposed by IB on a single data query for the different bar sizes. jTWSdump can batch several data queries in a single request in order to overcome these limitations. It automatically sets the query duration to maximize the amount of data downloaded for the selected bar size and then you need only to set the Number of Queries. Example: to request 3 months of 1 minute data you would set the bar size to 1 minute (jTWSdump automatically sets the Query Duration to 10 Days for this bar size) and then you would set the Number of Queries to 9 (10 Days x 9 = 90 Days ~ 3 months). A maximum of 5 years of data can be downloaded for bar sizes: 1 min, 2 mins, 3 mins, 5 mins, 15 mins, ... Here's a breakdown of the maximum amount of downloaded data for smaller bar sizes (24 hour session): 1 sec ~ 2 days, 5 secs ~ 10 days, 15 secs ~ 1 month and 30 secs ~ 3 months (for RTH session twice as much data can be downloaded). By means of an input file, jTWSdump can download even more data for these smaller bar sizes but it will be time consuming. jTWSdump is able to manage pacing violation errors and can work unattended in the background downloading data while you perform other tasks. "EUR" "CASH" "IDEALPRO" "0" "0.0" "" "USD" "" "1 M" "1 day" "0" "MIDPOINT" "1" ""
"GOOG" "STK" "SMART" "0" "0.0" "" "" "" "1 D" "5 mins" "1" "TRADES" "1" ""
"ER2" "FUT" "GLOBEX" "200706" "0.0" "" "" "" "1 D" "2 mins" "0" "TRADES" "1" ""
"QQQ" "OPT" "SMART" "20070615" "45.0" "PUT" "" "" "1 W" "1 hour" "1" "TRADES" "1" ""
"INDU" "IND" "NYSE" "0" "0.0" "" "" "" "1 M" "1 day" "1" "TRADES" "1" ""
These are text files which could now be imported into any charting/analysis software or opened with a text editor. The input file had been created by jTWSdump making use of the manual data requests we entered in the graphical interface but it could have been created with a text editor or programmatically. Here is another example: we manually requested one month of daily data for each Dow Jones Industrials stock using the graphical interface. jTWSdump saved automatically all requests to file dump.txt. After exiting jTWSdump we renamed the file to dump_dow.txt so that it wouldn't be overwritten. The next day we instructed jTWSdump to use the stored dump_dow.txt file and jTWSdump re-generated 30 data files for all Dow stocks in one minute (note that data requests during regular trading hours take more time to complete). If you are not happy with the default jTWSdump functioning I can customize it prior to delivery. To reach me use the Contact form. © Copyright 2007-2019 Trading Software Lab. All rights reserved.